Porsche Museum’s own publishing company was given the “International Historic Award” in the “Publication of the Year” category. The work in question was a comprehensive reference book relating to the legendary Porsche 917. “Edition Porsche Museum” celebrates the most important accolade in the world of vintage cars: Porsche Museum's own publishing company was given the “International Historic Award” in the “Publication of the Year” category. On November 17, 2016, the author of the book, Walter Näher, and the Head of the Porsche AG Historical Archive, Dieter Landenberger, accepted the prize in London. At the Geneva Motor Show in 1969, Porsche presented a car that even by modern standards can only be described as a “super sportscar”, a moniker which still fails to tell the full story. This was of course the Porsche 917. 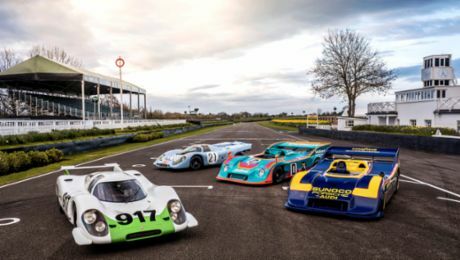 As one of the fastest and most successful racing cars of all time, the Porsche 917 has achieved legendary status, and it remains just as attractive as ever: In the renowned British “Motor Sport” magazine, the 917 was chosen as the “Greatest racing car in history” by 50 international motorsport experts. In total, Porsche built 65 units of the 917: 44 sportscars in the form of long-tail and short-tail coupés, two PA Spyders and 19 sportscars in the form of CanAm Spyders and Interserie Spyders with up to 1400-hp turbo engines. Typically for Porsche, the technology developed to increase the performance of these racing cars has been successfully transferred across to the sportscars designed for the roads. The exhaust turbocharger was put to just such use in the 911 Turbo from 1974 onwards and became an embodiment of the performance of Porsche sportscars from this point on. All this–and even more–information can be found in the 576-page book titled “Porsche 917 – Archive and Works Catalogue 1968–1975”, which was recently honoured in London. Walter Näher, who worked on the book along with the Historical Archive, took part in the 24 Hours of Le Mans race 19 times–as a racing engineer and as a member of the works team. 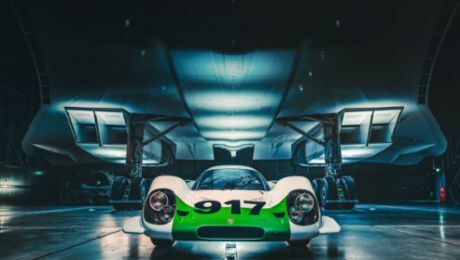 His experiences have given him a familiarity with the 917 that is matched by few others. This unique level of expertise is reflected on every page of his book, which is the result of several years of research. Näher uses supporting documents to describe the origin and continued development of the 917 from the plant perspective, right down to the finest detail. The author had access to all sources and photos within the Porsche works archive for this purpose. The book, which was co-published by Edition Porsche Museum and Delius Klasing publishing company, is available in the Porsche Museum and from book shops (ISBN-10: 3768838358) in German (EUR 79.90) and English (EUR 98.00).